End of the Road Festival is set in lovely old Victorian pleasure gardens, woodlands and fields located on a slight hill. It is predominantly a greenfield site with varying gradients, types of terrain and pathways. The natural terrain is bumpy in parts as you would expect in lush countryside but most of the festival areas can be reached via a road or pathway. We are committed to doing everything we can to make the festival accessible to everyone. Here is more information to help you plan your time at the festival. End of the Road is a small festival, with the stages, bars and village traders positioned relatively close to one another. There are a variety of tarmac, gravel and wood chip roads and pathways linking all of the festival spaces and facilities. All of the traders and food stalls are on level grass and have flat areas in front of their counters. At Joe’s Green we have to protect the grass as it is the Victorian wedding Lawn so the Peacock Bar has a small step up into the marquee. The Disco Ship area is mainly woodchip and wooded forest floor with trees lying on the ground and some tree roots. This area is lit at night but can be difficult to manoeuvre when it’s busy. Unfortunately due to space here we are unable to put a ramp up to the dance floor. The Comedy Stage is at the bottom of a steep hill in the woods, access to which is via a woodland pathway down a short incline. There are stewards at the gate to advise you of the route down and we have created a viewing area half way so you can have a good view of the stage without going all the way down. 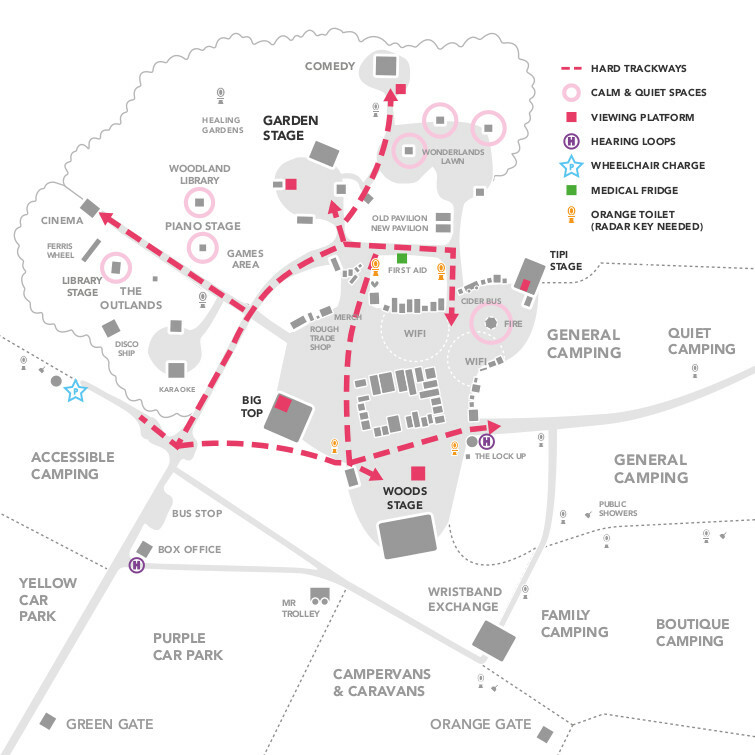 To help with access, especially in wet weather, there is a tarmac road from the Accessible Campsite which will give you backstage routes straight up to the Gardens, Joe’s Green, the Cinema, Tipi Arena and into the main festival Village. In the festival Village there is a road that runs past the Big Top and down to the Woods Stage. The Gardens, Wonderlands, Games Area, Library Stage, Piano Stage and Fairylight Woods are all linked with smaller gravel or woodchip pathways which are wide enough for wheelchairs and pushchairs, and even in the rain are pretty protected by the tree cover. Once you have bought your ticket, if you require use of accessible facilities or wish to apply for a personal assistant ticket, please e-mail Charlie at access@endoftheroadfestival.com with the following information. – D/deaf or blind registration. – The Access Card of equivalent. 5. Do you wish to camp in the accessible camping area? 6. Will you be in a tent or a campervan/caravan? 7. What is the model and registration number of your vehicle? Once all documentation has been received and processed, you will receive confirmation by email. All documentation is kept secure and destroyed after processing. When you arrive through Green Gate, please ask the traffic stewards to direct you to Box Office where you can collect your wristbands and parking passes. There are no steps at Box Office but we can’t lower the counter. Our Box Office staff are super friendly and will come out of their little cabin to assist you so please just ask! Accessible Camping is then just a short drive down the main driveway and on your left. For full information on getting to the festival please visit our travel page. Details regarding 2019 coach travel will be posted in due course. We have a mixture of viewing platforms and viewing areas, please make the stewards in these areas aware if you require access. Access will be granted to those with the correct lanyard, which you will receive when you collect your wristbands from the Box Office and are limited to 2 per party. Viewing platforms are available at the Woods Stage, the Garden Stage and the Big Top. Viewing areas are available at the Tipi and the Comedy stage. The platforms and viewing areas operate on a first-come, first-served basis and we cannot guarantee access at busy times. If the platforms or viewing areas are full, we will operate a one-in, one-out process. The nearest accessible toilets to the Woods Stage is 50m behind to the right. The Big Top is outside and down towards the Woods Stage, approx 100m. The Tipi Stage is on the way to the Wonderland, approx 100m. The Garden Stage is to the left of the platform just down the line of hedges about 50m. On each platform there will be a few chairs and all have ramp access. You can park very close to your tent in Accessible Camping and there are toilets and showers within 30m. Please speak to the campsite stewards for help with anything else you need to make your stay comfortable and safe. We will try to accommodate as much as we can. Wheelchair charging will be available within the accessible campsite, located at the Campsite Information tent by the toilets & showers. Please liaise with our accessible campsite staff about your requirements when you arrive. Any items will be left at your own risk. If you have special adapters please bring them with you as we can supply 16amp or 13amp sockets only. Are located at all of the toilet blocks at the festival. Some of these also have baby changing facilities in them. If you have a RADAR key please bring it with you as we use these locks on the toilets where possible. If you’re looking to get away from the crowds to an area with less people, we suggest the following areas Library, Fairy Light Woods, Wonderland Lawns and the Tipi Fire. The Piano Stage is also a really relaxed space and you can see some special acts here if you’re lucky! Hearing loops will be available at the Box Office and the Information Point. If you have medical supplies that require refrigeration, please take them to our First Aid and Welfare Tent near Joe’s Green. Our medical staff can look after it for you safely over the weekend. Please bring some form of ID with you as we will only be able to hand medication back to the named person or their PA.
Certified guide dogs are allowed at the festival. You will need to provide a copy of their ADUK identification form. Please e-mail Charlie at access@endoftheroadfestival.com. Strobe lighting may be used throughout the festival site. Please speak to stewards on site for more information.